This text provides students and other health professionals with the knowledge necessary to interpret clinical research articles, design clinical studies, and learn essential epidemiological concepts in an expedient and concise manner. 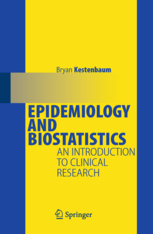 Fundamental concepts are presented in a highly succinct format suitable for students with no previous background in epidemiology or statistics. Drawing on teaching experience and student feedback, the author has created a text that attempts to recreate the perspective of learning epidemiology and biostatistics for the first time. The text serves as a rapid, intensive course in clinical research methods that can be used by students taking the required epidemiology course, residency and fellowship programs for physicians entering the clinical research portion of their training, and clinical research programs in fields such as nursing and nutrition that need an intensive course in clinical research design.